THE FOLLOWING MESSAGE IS TRANSMITTED AT THE REQUEST OF THE COLORADO AVALANCHE INFORMATION CENTER. Summit County, Sawatch, Aspen, Gunnison, Grand Mesa. The North San Juan zone has been added to this warning. release naturally, human-triggered avalanches are very likely. 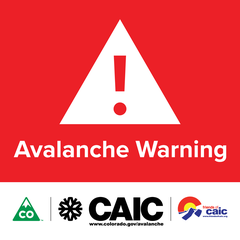 Do not travel in or below avalanche terrain. Be Prepared with a winter kit on your vehicle (extra blankets, water, food).